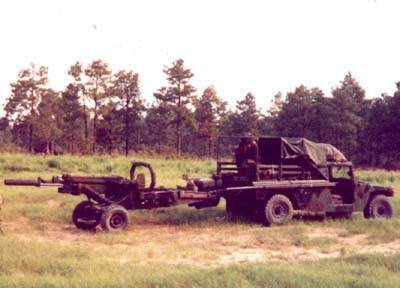 This is an 82nd Airborne M102, 105mm Howitzer with a M998 cargo/troop carrier. This particular photo is from A Btry 3/319 Airborne Field Artillery. Please note the roll bar on the 105. It's to keep the sight mounts from being damaged if the drop platform flips on landing.